Working with files and folders is a common task which can be significantly faster if you’re using the appropriate tool. FileBot is a powerful file and folder management program that makes it easy to analyze locally stored files and folders, but also batch rename items, download subtitles, create SVF files and view episode lists. FileBot lets you create custom lists with a certain pattern which you can export to your hard drive as plain text files. Also, you can load multiple files into the app and batch rename them with ease. The tool also makes it possible to analyze files, and for this purpose it shows the loaded items as a folder structure in the main window. FileBot displays relevant details regarding the current file selection like total size and number of files with a specific extension contained in a certain folder. 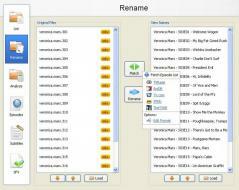 Furthermore, the application is able to download episode lists from TV.com, TVRage and AniDB, as well as subtitles from OpenSubtitles.